Hey, I’m back! The new kitchen is unpacked and fully functional (finally! 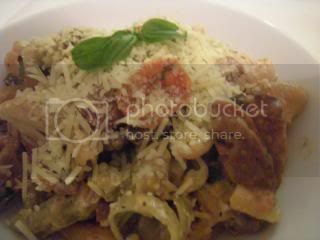 ), and so I would like to present a brand new recipe for you. Not all pasta sauces need to be very liquid. 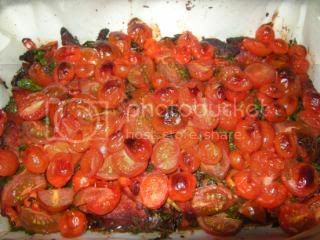 This one is a roasted sauce, with the focus on the cherry tomatoes. I used a few different varieties here, but just pick whatever you like the look of. If you can find (or have growing) some different coloured tomatoes, that’s fantastic. 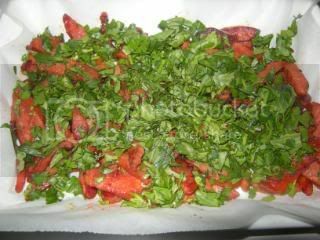 Of course, there’s nothing stopping you using diced ordinary tomatoes, but you will lose some of the wonderful texture that comes through with the blackened skin. 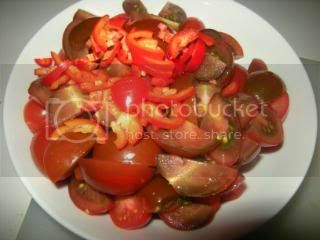 If you do use big tomatoes, consider throwing in a punnet of cherry tomatoes as well to try and mitigate that. 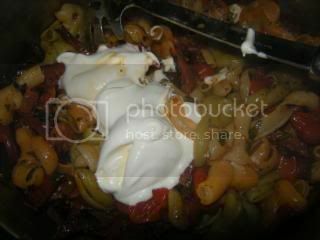 The chorizo adds a lovely flavour, and the sour cream lightens the whole dish. 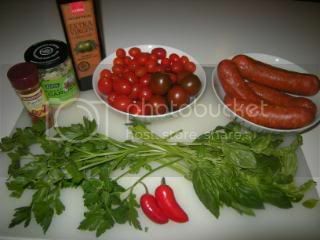 Vegetarian: leave out the chorizo and add some zucchini, and yellow and orange capsicum with the tomatoes. You could also steam some broccoli florets and add them in at the very end. Leave out the sour cream and the cheese on top, and it would work as a vegan dish too. 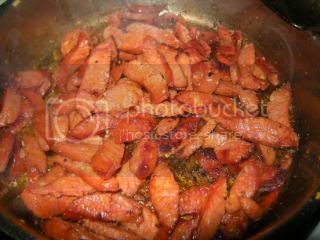 Chicken: use half the chorizo, and add some diced chicken thighs. Cook the chorizo with the garlic and paprika, take it out, and then cook the chicken in the pan before deglazing. Then add the chicken in at the very end (don’t roast it). 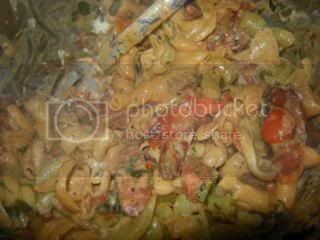 Salad: Let the pasta and the sauce cool once they’re cooked, and stir everything together cold. Sour cream can stay or go, but stir some parmesan through, and throw in a handful of pine nuts. Slap it all into a plastic container and pack the picnic basket! Very much a spring dish! Some crusty Italian bread on the side, a sprinkling of parmesan, and a glass of red. Imagine sitting out on the verandah, watching the sun go down, with some pasta in a bowl on your lap, and a glass of wine in hand. It doesn’t get much better than that! Here we have: Paprika; minced garlic (lots of it – about five cloves, finely chopped); extra virgin olive oil; three varieties of cherry tomatoes (pick your favourites: I’ve got some really tiny cherry tomatoes at the back, grape tomatoes on the left, and cherry kumatoes on the right); chorizo sausages (any Italian-style or spicy sausage will do); lots of fresh basil and continental parsley (you really do need fresh for this recipe. 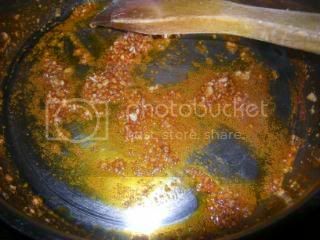 You could also add some marjoram or oregano, but in lesser quantities); two small hot chillies (or chilli powder if that’s what you have. 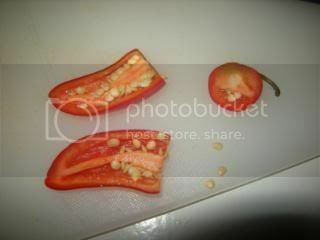 You could also replace them with milder chillies, or omit them altogether, if you don’t want it spicy). Preheat your oven to about 150 degrees. If you can, use the top element only. 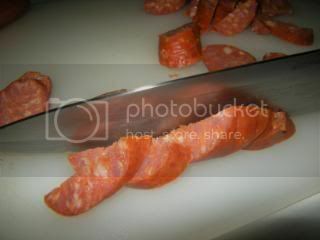 Slice the chorizo on an angle. Then cut every piece in half lengthways, to form strips. 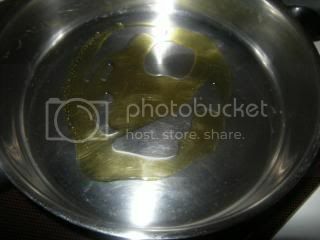 Put a saucepan over medium heat, and slop some olive oil in. Add in the garlic and the paprika. I’ve used quite a lot of paprika here, because the chorizo I bought didn’t look particularly promising. 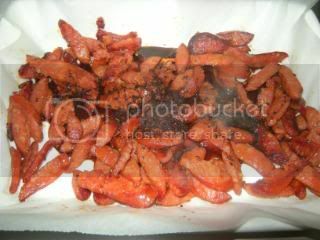 Let it sizzle for a while, you should be able to smell the paprika cooking after a couple of minutes. 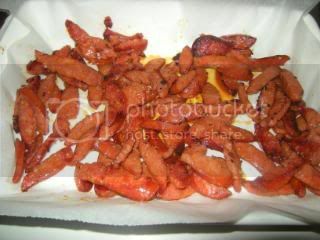 Throw the chorizo slices in. 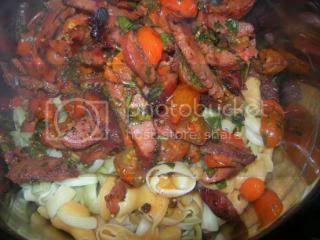 Stir it all around until the garlic and the paprika is well mixed in with the chorizo. Let it sizzle for a good five or ten minutes, just give it a stir every so often while you get on with chopping the rest of the ingredients up. 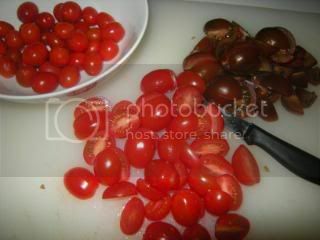 Try and make the tomatoes evenly sized. I chopped the kumatoes into quarters, the grapes in half, and left the little tiny ones whole (just make sure to pick through them and get any squishy ones out). Now on to the chillies. 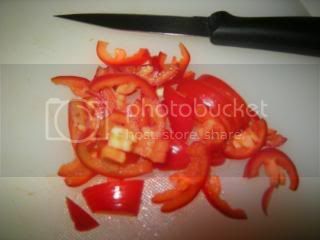 A lot of people like to use disposable plastic gloves when they chop chillies. I’ll confess to not being that organised. If you don’t use gloves, just make sure you wash your hands with a bit of dishwashing detergent as soon as you’ve finished. Keep your fingers away from your eyes, and after 10-20 minutes, go and give them another wash. That should put paid to the worst of it. Firstly, lop the top off. Hold the chilli in your left hand, between thumb and index finger, with the pointy end sticking straight up. 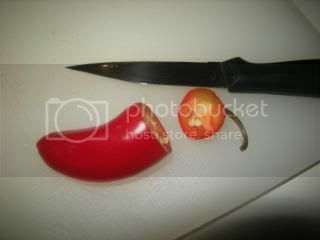 Then poke your paring knife between your thumb and finger, and cut it straight down the middle (the chilli, I mean, not your finger). Scrape the seeds out with the point of your knife. I collect my vegie scraps to put on the garden, so I do it straight into the bowl of scraps. Otherwise, you can do it straight into the bin, or onto a paper towel to be thrown away. Try not to play with them too much – the heat really will get everwhere, and you’ll have a hard time getting rid of it. 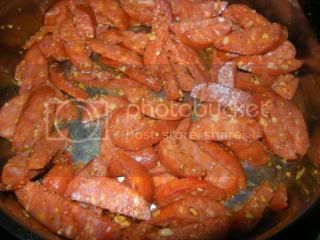 Here’s our bowl of tomato and chilli, ready to be roasted. 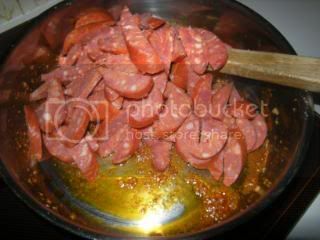 Your chorizo should be starting to look a little browned now, and the bottom of the pan should have a lovely brown coating on it. Line a ceramic baking dish with some baking paper, letting it hang over the edges. Throw the chorizo in. I deglazed with some red wine. You could also use chicken or vegetable stock, or even just a little water. Whatever you use, throw about half to one cup in, and let it simmer down for a few minutes. 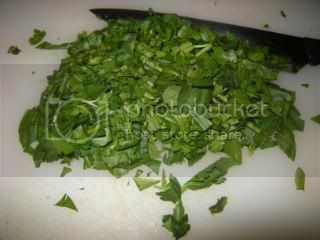 While that’s simmering, roughly chop the herbs with your chef’s knife. You want it pretty chunky, so that it adds to the colour of the dish. They will also reduce in size quite a lot as they cook. 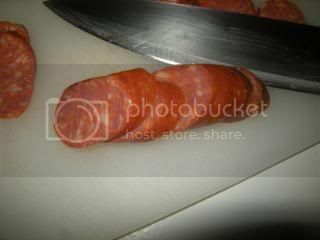 Scrape the pan clean, and throw the wine/stock/water on top of the chorizo in the baking dish. Sprinkle the herbs over the top. And then throw the tomato and chilli in. Grab your olive oil and give it a really good drizzle over the top of the whole thing. 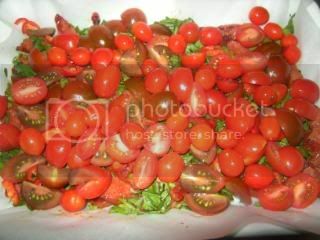 This will help the tomatoes roast and blacken. Pop into a slow oven. If you can use the top element only, do. 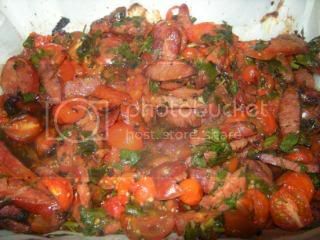 The idea is to cook the tomatoes on the top layer, while slowly warming the lower layers, and letting the flavours of the tomato and chilli seep down into the herbs and sausage. 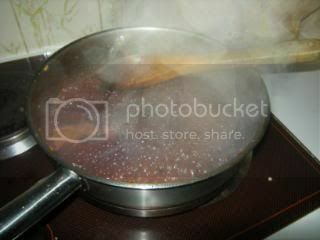 Put your pot of water on to boil, and keep a close eye on the sauce, it won’t take very long. 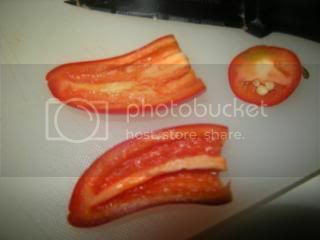 As soon as you can see the skin on the exposed tomato skins start to blister and blacken, just turn the heat off. It will probably take about 20 minutes. If your pasta isn’t quite cooked, let the sauce sit in the warm oven with the door shut until you’re ready for it. Sitting will let the flavours steep a little longer, so it’s a good thing. When the pasta is cooked, drain it well in a colander. 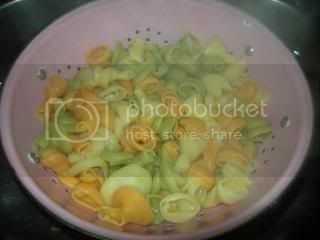 I’ve picked a large tri-coloured spiral pasta. The different colours look amazing with the colourful sauce. Any large shape will do – a fat spiral, or a large shell to hold on to that chunky sauce. 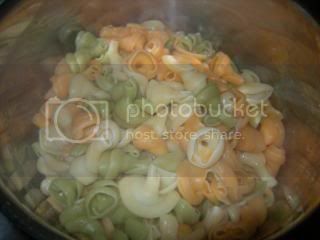 Tip the pasta back into the pot. Take the sauce out of the oven, and give it a gentle stir with a dessert spoon. Position the sauce right next to the pot, and grab three corners of the paper with one hand, making sure all the juices stay in. Grab the fourth corner with your free hand, and pick the whole thing up and hold it over the pot of pasta. 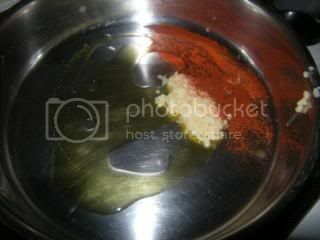 Line it up, then drop the fourth corner, allowing the sauce to slither out on to the pasta. Stir it all through. If you’re adding sour cream, throw in a good dollop now. Stir the sour cream in. Stick it all on to plates, and sprinkle with a bit of parmesan. Very nice! 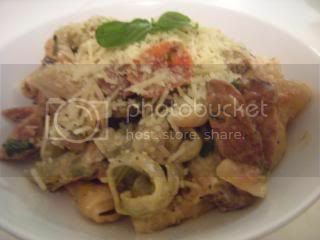 Photos are in their regular spot, in the Roasted Cherry Tomato Pasta Photobucket album.